An even more important reason why we should all have the relevant log ins. It’s less than seven months until 1 October 2018 when the NHS e-Referral Service (e-RS) needs to be used for all referrals to consultant-led outpatient services. The new GP contract, which will take effect from 1 April 2018, includes a further investment of £10 million in practices to support full implementation of e-RS at every GP practice by October 2018. Project teams across the country are working hard towards the deadline and NHS Digital staff are supporting them. There's a range of resources available on the NHS Digital website, including an implementation pack, communication toolkit and a video case study featuring the health community in Yeovil. Nineteen trusts have now switched off paper referrals and a further 17 are due to switch before the end of the month. Find out the latest paper switch off dates for all NHS trusts. As trusts make the switch, we’d encourage you to celebrate your success and let your wider community know more about your achievement and the benefits of e-RS. We’ve included a press release template in the paper switch-off communication toolkit to help you. If you need any help or advice about switching off paper referrals, contact us at office.ibc@nhs.net and we will put you in touch with your local lead. We are launching a social media campaign on Twitter and LinkedIn and it would be great if you could join the conversation using the hashtag #JusteReferrals. 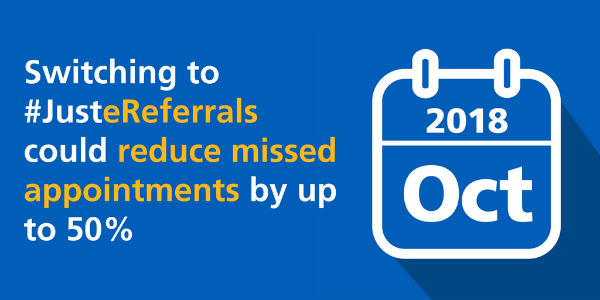 We want to highlight how colleagues can get support and guidance about switching off paper referrals. You can also read a recent blog from Eve Roodhouse, Director for Implementation and Programmes at NHS Digital, where she reflects on the e-RS journey so far and the approach to maximising the benefits that it presents. We are looking at ways of improving e-RS learning and support resources. To help us understand what you think about the current resources, please complete this short survey, which will be available until 13 April. Your feedback will help us to understand what works well now and what we can improve for the future. To help you get the most out of e-RS, we are developing some short videos to explain different parts of the system. The first one focuses on how patients can book their own appointments online through the ‘Manage Your Referral’ website. We are also working on more videos which will explain how to book two-week wait appointments, using Advice and Guidance and making a routine referral. Thanks to user feedback, the e-RS is continually improving to make it easier, quicker and more convenient to use. Take a look at the updated roadmap which outlines e-RS developments, including future plans for emailing appointment information to patients, new patient letters and enhancements to Appointment Slot Issues and Referral Assessment Service features. Appointment Slot Issues (ASIs) – when a user 'deferred' to a service and this resulted in an Appointment Slot Issue (ASI), the provider was unable to see the clinical information. The provider can now see the deferred referral with clinical information attached in the Deferral Summary page. Further information. Information to patients – service definers can now provide patients with patient-facing contact information in a new section called ‘Patients’ in contact information. Two fields can be updated, ‘patient telephone line’ – the phone number for patients to call and ‘hours of operation’ – letting you define the opening hours of the service for the patient. This information will be visible to patients and professional users from the April e-RS release, so please ensure the details are added to your services now. Further information.